What’s the Next Cool Thing? What a few weeks we have been having here folks. Gorgeous weather, nice harvests, and tons of exciting new things. By now I hope you have all tried the amazing new bread options. It most definitely has filled a void for us. And every time we launch a cool new thing, we get flooded with emails, calls and Post-It notes with ideas for the next cool thing. This time it has taken the shape of Gluten Free options. Seems like we have a bunch of members who are happy for the bakery items, but “hey, can you bring us some gluten free options too?” So no time to sit around patting ourselves on the back just yet, now we are on the gluten free trail. To begin with, we have added a tab on the web site to make it easy for the GF members to find what they are looking for. We have several items in there right now but will be making a big push to fill out that offering over the next few weeks. With that said, I must pause and thank everyone for their honest and sincere thoughts they share with all of us on a weekly basis. It makes designing the offering so much easier. After I failed out of Mind Reading 101, I realized that it is so much easier to just ask people what they want rather than try and get too clever. I am a firm believer that we are not here to reinvent the wheel. Just tell us what you like and we will try and find a way to deliver it. 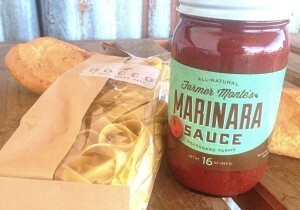 New product alert…Marinara Sauce. We began to bring you sauces (chile and BBQ) in an effort to make your cooking experience more fun and easier. Green and red chile sauce is not hard to make, but sometimes you just don’t want to spend the time, so we crack a jar. We figured that it you are going to crack the jar, crack into something awesome. So we launched the sauces several months ago. Here is where I have to be honest with you, I didn’t think that it would be all that popular. I thoughts folks would try it, but that it would fizzle out in a month or so. Boy have I been proven wrong. Our members love the sauces and sales have been surprising me. Because of their demand, it was easy to look and see that have been missing one huge hole, a tomato based sauce. I mean we sell pizza dough and cheese. We sell fresh pasta. We sell beef and sausage for making incredible meatballs. We sell eggplant. But we have not provided the missing link. And I am not talking about an 800 lb hairy guy called the missing link, but a yummy Marinara Sauce. So starting now, we have filled that spot. Being New Mexico we also realized that most pasta sauces are missing what most New Mexicans love, a little bite. So our sauce we have made with a kiss of ancho chile to help you remember that we are still in New Mexico Toto. Don’t worry, I have sampled it on kids and it is not too spicy for our little farmers out there. For those of you keeping score at home and connecting the dots, you will see a paint by numbers starting to take shape. The next-next cool thing that we will be bringing you is the birth of the meal kits. You see these a lot right now under various names and companies. My 2 pesos is that companies like Blue Apron will be a fad and bust because they have no authenticity or story to them. They are just a recipe in a ton of packaging that arrive at your door. Cute to do a couple of times, but doubt will be around to stand the test of time. But I have been known to be wrong. I thought Dancing with the Stars would be off the air in 3 weeks. Shows what I know. But what I do know is I like the idea of these recipe kits, but just want to see them done right with super high quality foods. Look for these kits to start getting more attention on our site. With the click of a button, you will be able to add everything that you will need for pulled pork sandwiches, pizza night with the fam, or a slew of other ideas. We all are guilty of getting stuck in a rut of what we make in the kitchen. The receptive audience for my taco bar is wearing thin, for example. So we want to spice up the creative juices by giving all of us simple, quick, and good value meals that we can easily order with a click of a button. You think sampling breads and pastries is easy?? Well it’s hard work, but someone has got to do it! So last week I promised some big news this week. And since I am not one to cry wolf, I will lay it out for you. This will be the biggest thing since sliced bread. Oh, but wait a second, the news is sliced bread. Do I have your attention yet? Good, so let’s set the stage here. The modern day grocery store has all but killed the artisan bakery. In the produce world we talk about food in terms of days. Not very forgiving. But in the bakery realm, you hear the food talked about in terms of hours. Or at least you should. But with freezers and additives, most bakeries have bought themselves “shelf life.” Today, breads are not looked at in terms of a can of beans, but they are pretty close. And you know what, we have paid the price with the quality that most grocery stores try and sell us. 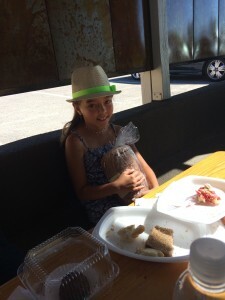 So this summer, the fam and I visited Durango and went into a small bakery. I have forgotten the name but not forgotten the quality of the goods. I left that bakery with a clear vision for the next food revolution brought to you by the farm. I knew we needed to revamp our bakery section. We need to bring you something special. You see, I fixate on one question the majority of my working and waking hours– how can we give you an authentic and memorable experience with your food? I know that may sound cheesy but it is the truth. When you think about our David against Goliath business model, the difference between perseverance and closing up the farm boils down to bringing you something special. There are bigger and more diverse places to buy food with huge advertising budgets to lure you in through their doors. For most of us, where we buy food is not a necessity any more. We have plenty of choices. In my grandfather’s small town of Makoti, North Dakota (population 125) there were no options. One market fed the town. Again, for most of us, those days are over. We are inundated with choices. And so to remain relevant (and alive) in this consolidated food industry, we have to bring you something different. Something special. We have to make this Special a part of your lifestyle and a part of your daily routine. So trying to figure out what this Special looks like consumes my life. Well, it means two things. First, I have realized the limitation of our baked goods and we will be expanding the bakery offerings. We will be immediately adding French baguettes, dinner rolls, hamburger/sandwich buns, European style pastries, stuffed croissants, pretzel rolls and yes, even cinnamon bread for your french toast breakfast. Second, all of these goodies will have one thing in common—they will not be baked unless you order them. So at your 10am cut-off time, we will collect all bread orders and send them to the bakery. The bakers come in at 9pm and bake all of your orders overnight. Then at 8:30am, the bread jumps on a delivery truck and heads to your home or office along with the rest of your order. The beauty of this new system is in the simplicity. In a grocery store, the bakery has to fill the shelves to give the sense of abundance. No one wants to buy the last loaf. But this system creates waste and the bakery has to eat (literally) any bread the store does not sell. The grocery store is just a consignment shop for the bakery, there are no guaranteed sales. This model is not good for the bakery or the consumer. So say good bye to day-old bread model and hola to the way breads should be, fresh. Finally on this wonderful fall week, flowers. We have teamed up with a local florist to bring a splash of color to your orders. We will have a rotating selection of a Bouquet of the Week. Always gorgeous, always fresh. Add these to your orders beginning now as well.